Rob, Kevin, and Jonathan had wanted to do a tech dive on Friday, assuming that we passed Tech 1. I told them that I would see how worn out I was by the end of class. Then by the end of class, they were all chickening out and saying they were tired. By Thursday I guess they had recovered enough to realize it would be silly not to dive when we were all taking the day off anyway. So the four of us decided to scooter out to the Beto's Reef/Three Sisters area, but this time with a little less pressure on our bottom time :) I also wanted to go out to the end of Beto's Reef, since I have never been past about 110' there. Anyway, as we discussed it and negotiated where to go, we eventually settled on going to Three Sisters, and then heading out slightly north or northwest from there, hanging out there a couple minutes, and then heading over to Beto's and running to the end of that. I guess the area to the north/northwest of Three Sisters is referred to as the "Road to Twin Peaks". 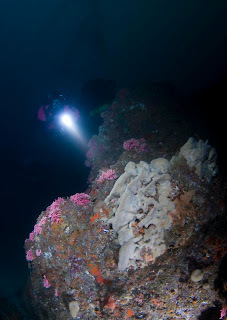 Our plan was to spend about 10 minutes scooting out to the Sisters, and then 25 minutes at an average depth of about 120', and then we would head in and deco along Lone Metridium, Hole in the Wall, and Middle Reef on the way in. I was leading the dive, and Kevin was going to lead deco. Kevin and I were team 1, and Rob and Jonathan were team 2. I'm not sure if I have led a scooter dive before, so I was quite excited (and I was also excited to not be paired up with Rob, since that seems to always happen when we are diving as a foursome). I was, however, a little nervous about the navigation, because even though I have navigated to Three Sisters (though it's been a while) and Beto's Reef, I have never done the whole loop in one dive. The surface conditions were terrible when we got to Monterey, which was expected based on the forecast. We all met up at Jonathan's place to do a little planning with GlobalMapper and to pick up scooters and other various bits of gear we had left there after class. It was really windy and it was raining pretty hard. We decided that getting dressed at Lobos would be very unpleasant, so we setup all of our gear and got into our drysuits in Jonathan's garage, and then drove over to Lobos. We must have looked pretty silly driving around in our drysuits :) As we passed Monastery, it was eerily calm -- you could see whitecaps out beyond the beach, but up by the beach there no water movement. It was like a lake! When we got to Lobos (after 10, can you believe it!?! ), it was just the four of us, and Phil Sammet with some students on his RIB. The water at Lobos was calm as well, but with a little sputtering on the surface from the wind. The most uncomfortable thing about the conditions was that it was raining HARD, and we were getting pelted with sideways rain drops. 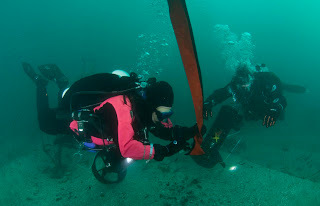 It was a relief to put my mask on because it protected my face :) There was a bunch of dead kelp floating on the ramp that I guess had gotten pushed in by the wind. We had to crawl through it without actually stepping on it (since that was a recipe for slipping). After a little bit of scooter drama on the way into the water, we headed out and dropped at the edge of the cove (near the worm patch). The visibility was fantastic -- at least 30 feet right where we dropped. Actually it was probably even better than that; I just remember being dazzled by it when we first dropped and I looked from person to person in our little diamond formation. Anyhoo, we headed out to the sand channel. One nice thing about leading with Kevin as #2 is that he is really good at staying exactly where I want him so I barely have to move my head to look at it. Before I knew it, we were at Hole in the Wall. Every time we got to a waypoint on the trip out, I would confirm the direction of the next segment, since I figured it would be embarrassing to get lost on the way to Three Sisters :) So then we hopped over to the Lone Metridium (who was very open and happy looking), and then before you know it, we were scooting past the big elephant ear on the east side of the second sister. I think it was somewhere between Lone Metrid and the sister that I decided to try a barrel roll for the camera (Jonathan was using the CSI cam scooter). I think either Jonathan or Rob did a barrel roll and that inspired me to try, and Jonathan was pointing the camera right at me. So I went for it, and it worked!! My first successful barrel roll, and I was even toting a bottle. Anyhoo, after we got to the sister, I paused briefly to get my bearings and confirm with Kevin, and I took us along the interface between the sand and the reef that extends to the north of the sister. After about 2 minutes, we came to a spot that I thought would be nice for some pictures, and I signaled everyone to clip off. We were in about 125 or so feet at this point. There were elephant ears, gorgonians, and hydrocoral (including a bunch of little baby stalks). I also noticed some Spanish shawls, and a bunch of rockfish (vermilion, copper). 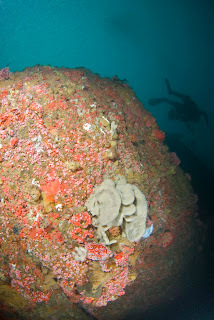 I also noticed that the reddish-orange "finger sponges" (that's what we call them anyway) which we see at Beto's Reef were here too, but they were more three dimensional, more like trees rather than fingers. After Rob took a few pictures, we swam over to another peak that we could see in the distance, and that was even nicer. The structure was just more encrusted with more colors. Lots of pink and yellow. We decided to stay a couple extra minutes here and just shave off however many minutes from the deep side of Beto's. Before long, it was time to head back. We cruised back along the reef-sand interface until we hit the sister, and then we headed over to Beto's. By the time we got there, we only had a few minutes left before we were to head in, so I just zoomed along the top (which Kevin gave me grief for "thinking like a recreational diver" by going along the top and not the bottom!) for a minute and then turned around and came back. Then I handed over control to our deco captain and he started to lead us in. Right around then, Rob's light died (I think it had already died once, and he turned it off and back on and it came back). When we got to the surface the wind was still pounding us with rain, so we tried to get out of there as quickly as we had gotten in. My X-table had been blown over by the wind (DUH in hindsight... I am lucky it was only blown halfway across the parking lot and not into the water!). Phil was pulling his boat into the cove as we were getting out, so we chatted with him briefly before heading back to Jonathan's. We watched the video while having hot chocolate and pizza, but unfortunately the file was somehow corrupt so that we couldn't watch past about Lone Metridium on the way out :( Hopefully someone smarter than us can figure out how to view the rest of the file! Last weekend, Team Kitty's long-awaited GUE Tech 1 class finally arrived. The class ran Saturday through Wednesday, with an optional sixth day on Thursday if weather or team suckiness prevented us from finishing in five days. We were taking the class with Beto Nava and David Rhea. 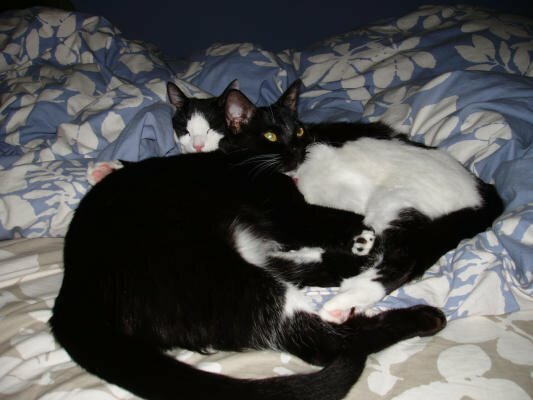 Beto was working on his internship to become a Tech 1 instructor, so he basically taught the class, and David observed. I am not going to give the usual dive-by-dive, minute-by-minute that I give in my reports, since I wouldn't want to spoil all of the mystery (although I've been assured that every class is different); plus, I doubt I could remember it all at this point, even if I wanted to :) But hopefully this report will give you an idea of the format of the class and what is covered, and my perspective on it. Pictures courtesy of Susan Bird/BAUE (the rest of them are here). 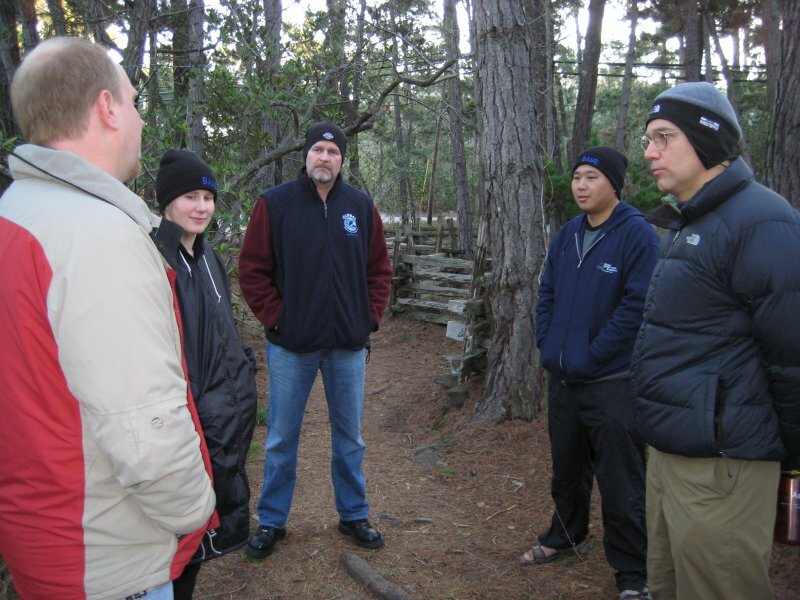 The first two days we were at Point Lobos, doing various land drills and diving. We met at 8 AM at the gate on Saturday, and before the park opened, we got the intro spiel about the class and GUE and did introductions. After the park opened, we got a presentation on running line and did some land drills over in the woods next to the cabin by Whaler's Cove. We had all done a line clinic with Beto before, and this was pretty much the same material. Next we went over valve failures and did land drills for those as well. Then we had a short break for lunch. I was so nervous about the first dives that I barely ate anything. Then we discussed the dives we would be doing that day. 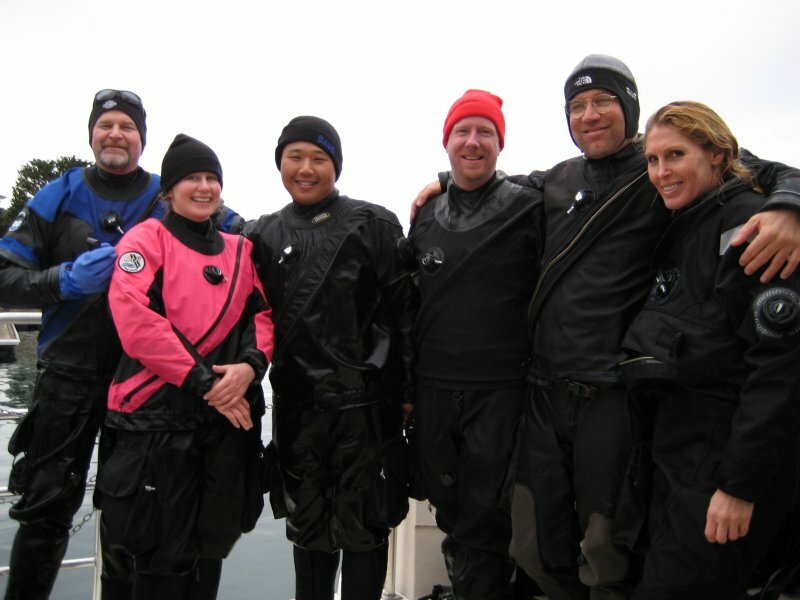 The plan was to get in the water once, and do multiple short dives, and we would debrief each dive on the surface. This has its pluses and minuses; it is certainly efficient (timewise), and saves the energy of schlepping in and out of the water, but it is very cold (and slightly brutal for those of us without p valves, which my teammates tell me is an "equipment failure"). The first dive was a skills dive and then after that we'd do several scenario dives, until we ran low on gas, daylight, or warmth. This was pretty much how the dives went each day -- some skills dives and some scenario dives. The skills dives were doing things like valve drills, S drills, bag shoots, and deco bottle switches in midwater. In the scenario dives, we would do a little dive and be subjected to various failures and have to deal with them. In addition to the valve failures that we had covered, there might also be primary light failures and lost masks (in which case we deployed our backup, or if we were already on the backup, we had to be led out and up by the team). Some of the scenario dives were thirds dives where we ran line and had to return to the upline, and for some we were live boating and could use all of our available gas (and ascend wherever). The first skills dive (which I volunteered to lead since I have been told in the past that I should be more leaderful in the water) was pretty similar to the skills dives we'd been doing to train for the class. So I guess our training approach was pretty reasonable. The scenario dives were actually quite fun; I had this picture in my mind (based on class reports I had read) of it being very chaotic and stressful, but it really wasn't like that at all. We kept the team together really well, so every time something failed, someone else was on it really quickly. I think that was the key to it being fun instead of chaotic -- there were never really any situations like... I could really use a gas share right now and where the heck are my buddies? One nice thing about the first day is that it was very sunny and hot on the surface, so we could actually warm up a little between the dives. Rumor has it that we were in the water for about 4 hours that day (I really don't remember what time we got in the water, probably because I was too stressed out to read my watch), and I was cold at the end, but not as cold as I would have expected. When we finally got out, Lobos was pretty close to closing, so we had to haul out of there with just a quick rinse of the gear. Despite our late exit, David H was still loitering around and he helped us out of the water. After the dives, we got some food and did lecture and video review in one of the little rooms at Buzzard's (the BBQ place at the Travelodge -- we found out that Buzzard's was actually going out of business and Sunday would be their last day, which is too bad). The video review was not as big of a thing as it was in fundies -- we would basically just watch little clips that illustrated something they wanted us to see. We didn't finish until pretty late (maybe 9PM) and then we had homework to do too. After the diving, we headed over to Bamboo Reef to collect our tanks for the next day, and drop our empty ones. When we got there, we found an unfortunate note on the front door saying that their compressor was down. Eek. We had left doubles for them to fill with 30/30 and deco bottles to fill with 32% the afternoon before. 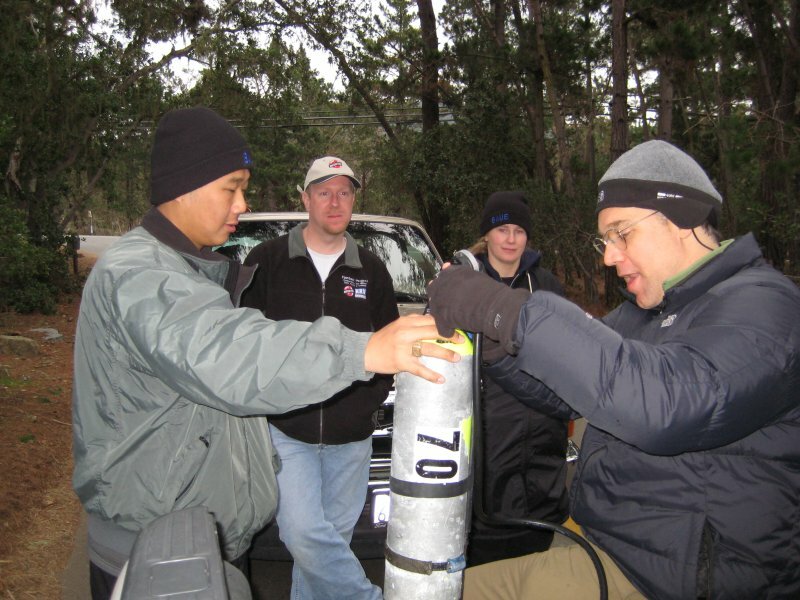 They had already filled three or four of our sets of doubles, and after some discussion they determined that they'd be able to fill the other doubles by using what was left in their air and nitrox banks. They also believed that they'd be able to use their banks to fill our doubles for the following day, so we left those, and took our deco bottles and argon to Aquarius. It was very unfortunate that their compressor went down, but they bent over backwards to accommodate us. After that we had a looong afternoon and evening of lecture. Our spirits were lifted, however, because we were covering the math-y part of the material, and since we are all dorks, we liked that part much more than the first day's material. I think we were all very competitive about who could do math in their head faster ;) After the lecture was over, I think we had some homework, plus we had to plan our dives for the next day. We were told what the dives would consist of (depths, skills we had to do, etc.) and we had to plan our bottom times, gas consumption, rock bottom (errr minimum gas... every time we used the term "rock bottom", Beto pretended he didn't know what that meant), etc. The last three days of the class were on the Escapade, which was nice since it meant no more Lobos ramp, which you know is a constant source of stress for me. And no surface swims. I was very concerned about my ability to endure 5 days of cold water diving in a row, and boat diving is definitely a lot less tiring. I know Rob and Kevin were very nervous about day 3, since they were both convinced that it was the toughest, make or break day. They thought that if we had to repeat any day, it would be day 3. I actually thought that if anything, I would freak out during one of the earlier failure scenarios, and I wasn't as paranoid about the ascent stuff. Anyhoo, we were again doing a combination of skills dives and scenario dives. Jim put us in an area where the bottom was about 100 feet, and we did the skills dives in 20 feet. The first skills dive was rather disorienting. We have practiced skills in 20 feet where you couldn't see the bottom, but there was kelp to give you some sort of reference. I thought that descending to 20 feet, settling down and shooting a bag was way harder than shooting a bag on the way up, after I'm already all settled into the dive. After the skills dives, we practiced a timed ascent from 100 feet. We basically went down to the bottom and then immediately started the ascent. We were down there long enough for me to see a Berthella, and then it was time to ascend. There were sea nettles with us on the ascent. We got back on the boat and had a surface interval before our final scenario dive. The scenario dive was actually a fun dive, because we saw some cool stuff as we were swimming around on the bottom (between the air gun going off :P). The site was flat shale, with one short ledge that we were roughly swimming along. We saw a bunch of Tochuina tetraquetra, which I have never seen before (except on the front of the nudi book :P). One of them was on a gorgonian, eating it. I also saw another Berthella, and several clown nudibranchs and Spanish shawls and other standard shale fare. Tons of brittle stars and cute little fish. We also came upon a boulder with a single Metridium on it. Anyhoo, we eventually had to leave after some sequence of failures, and we headed up and did a simulated deco schedule. During one of the debriefs, there was apparently a whale in the water behind us. Unfortunately I was busy stowing my deco reg, and I missed it :( So after the second dive, we took a little scenic whale watching tour. On the way in, we stopped in a shallow area and hopped in so I could do my maskless swim and ascent again. This time I decided to take David's advice and not be a wimp about keeping my eyes open, and it was SO MUCH EASIER. It took a moment for my eyes to adjust, but once they did, I could see everything. I could see every hand signal Rob gave before Kevin translated it to me by touch contact. Actually before they brought me up, Kevin went to clip of my light for me, but I really wanted to do it myself (with my new-found sight) so I kept pulling my hand away and trying to get the bolt snap from him. He didn't get it though, so I finally let him do it :) On the way back to the dock, Beto informed us that we would need 50% (the "big boy gas" as Kevin says) in our deco bottles for the next day. So we were all relieved that we would not have to repeat day 3. My suit leaked rather significantly on this day -- I was wet basically from the chest down, and there were literally pools of water in the socks of my suit :( I highly suspect it to be the inflator (which was leaking for a while and then stopped leaking after someone took it apart and put it back together). When we went back to Bamboo Reef, they had managed to fill half of our tanks with 21/35, but didn't have enough banked air/nitrox for the others. There was some discussion about taking the tanks with He/O2 in them over to Aquarius or MBDC to top with air/nitrox, but in the end, we instead deployed the rescue driver, Susan, to Anywater Sports with a seriously loaded down truck full of doubles and deco bottles. Obviously we did not want to have go up to San Jose more than once, so we sent two days worth of doubles and deco bottles (we had to beg, borrow, and steal to come up with enough deco bottles) up to get filled. Thanks a lot to Susan for driving to San Jose and back in the pouring rain, and thanks to Frank and the AWS crew for staying late to fill them. And to Jonathan for loaning us some surplus 40s. After that debacle, we did a bit more lecture on the CNS clock and other O2 related stuff, if I recall correctly. The CNS clock had always been very hand wavy and mysterious to me, but this lecture definitely cleared it up. We ended it pretty early because the room we were using for lecture was not available too late (due to the Buzzard's shutdown). So instead we spent some time planning our dives for the next day and we went over the plan with Beto and David that evening (which was good because it meant we didn't have to meet quite as early the next morning). The next morning I was really worn out, physically (I made Rob load my tanks onto the boat :P). On the other hand, I was actually feeling less stressed out about the class, so I think that was an improvement overall. Susan gave me a very encouraging pep talk when I told her that I was super pooped :) Once I got in the water, I sprung back to life. We did more scenario dives in 100 feet of water with simulated deco, and this time we got failures on the ascents. I had considered switching to my backup suit, but was sort of talked out of it since it might take some getting used to. Plus the planned dive times were not very long. As it turned out, my suit was bone dry the next two days, so I am glad I stuck with it. (It is now back at the suit hospital, waiting for an inflator valve transplant). Anyhoo, back to the diving. I actually found dealing with failed deco bottles to be easier than valve failures on the backgas, but Rob felt the other way. 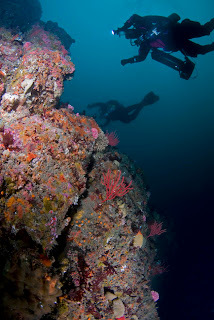 We were diving in the same area as the previous day, but today I think we saw at most one Tochuina. Otherwise we saw the same sort of stuff. We actually found the same lone metridium coming from the opposite direction. I think we saw more whales on the boat too, but to be honest, the days are starting to all blend together. I will say that in general, we saw a ton of whales and sea otters on the boat rides. At the end of the day, Beto told us that we needed to plan our experience dive for the next day, which would be a dive to 150' for 20 minutes. Ooh la la. So we retired to our room and we planned it. It took forever, probably because of a combination of all being totally zonked after four days and being giddy like school girls about the dive. Beto said that we would probably go to Mile Buoy, so we checked it out on GlobalMapper. The conditions turned out to be really good (which they were everyday that we were on the boat -- we got really lucky considering the season), so we decided to try for Carmel. We ended up going to Montana, just outside of Lobos. Jim showed us a little bathymetric map of the site as we were sitting on the boat about to get in the water. I guess the site tops out in 110 to 120 feet, and the bottom is about 150 feet. Jim dropped us at a down line he had put down, and we started to descend right away and did our bubble checks around 20 feet. When we got to about 50 feet, my ears started to misbehave (5 days in a row of diving in cold water was pretty challenging on my ears, which are often uncooperative). So we had to slow it down from 50 to 80 feet. Right around that depth, a ton of blue rockfish appeared. As we slowly descended into them it gave the sensation that they were swimming up at us. We finally got to the structure at around 120 feet, and for a second I think we were all like... what now? Apparently we looked like kids in a candy store. Then after a minute, Kevin led us down the side and started heading into the current even though we were liveboating (???). I pointed out to him that we were heading into the current but he didn't seem to get it. Apparently neither he nor Rob noticed the current (part of the kid-in-candy-store syndrome I guess). But it was pretty mild so I motioned for them to go ahead. There were lots of big elephant ear sponges, and gorgonians. I saw a few Spanish shawls, and one honkin Doris odhneri. I also noticed some big feather duster type worms than looked like really big Christmas tree worms. They were orange-brown in color. I actually noticed these recently in some video that David H shot at Twin Peaks and noted that I'd never seen them before. So I thought that was pretty cool. I kept expecting to hear an airgun go off behind my head :) Eventually we came around the corner and now we were going with the current. It was pretty fun, I didn't even have to fin and we were just slowly cruising along the structure. Before long, 20 minutes had passed and it was time to start the ascent. I was running deco, so I took over. The ascent was uneventful. I was quite cold on the stops, because I am just not used to not moving at all for 20 minutes (well, except when I'm counting nudibranchs :P). When we got to the surface, there were dolphins like 20 feet away from us leaping out of the water! It was super cool. I have never been in the water close to dolphins like that. Jim said that based on the position of our bag and the dolphins, he was hoping we'd see them while we were on deco, but unfortunately we did not. But seeing them on the surface was still really neat. On the ride home, we saw more whales and sea otters. As soon as we got back on the boat, we were told that we had passed the class. Phew. And that Beto was now officially a T1 instructor. Woohoo for all of us. We still had to do our final exam for the class. So we had a couple of hours to finish it before we met up and went over it. Then we wrapped up some final material, and we were finished. Overall, I really enjoyed the class. Even though it was really tiring, it was not nearly as stressful as I expected based on all the folklore I have heard about the class. Before the class, we were joking about plotting how much we hated each other as the class progressed, but we only really got annoyed at each other once (well, actually, I got mad at them :P). And as I mentioned earlier, the failure scenarios were not nearly as chaotic as I imagined. I suppose that is the point -- it shouldn't be chaotic, and if it is, you are doing something wrong. We got a variety of bits of advice from people going into the class, but I think the approach of just diving a lot together so we could read each other well and work well together was the most useful thing. But the skills practice we did was also all helpful because we had to do exactly the same stuff in class. I also think that diving two days a weekend was good for our dive endurance -- schlepping up and down the ramp 4 times a weekend at Lobos was good practice! By the end of the week, I actually felt like schlepping my doubles around on my back was easier than at the start. I guess I got desensitized. I also thought that Beto and David were both excellent instructors and I would recommend either of them. David is really really funny, which I think is good for setting the tone that he doesn't take himself too seriously (even though he is, ya know, a WKPP god). Beto is very dedicated to his students, and if it were not for all the time he has spent with us over the past year, there is no way we would have succeeded in the class. 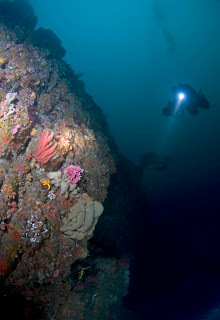 We went to Lobos on Sunday, since it seemed like it had been ages since we went diving (but only really two weeks :P). We had been planning to dive on Saturday, but our boat was canceled. We decided a while back (when we signed up for the boat) that we would use our last weekend before T1 to just have some fun -- no drills. So we grabbed scooters (thanks Jonathan) and hoped to get out under the surge. When we got there, we headed up the stairs to look down at the water. There were really big waves breaking on the Bluefish side of Cannery Point, but there was a really long period between them. The water looked very blue and we thought the visibility would be good. When we went back down to the ramp, we saw similar conditions -- it would be really churning for a while and then calm down for a while. Rob tossed in a float next to the ramp, and then he came back and reported that step 0 would be rescuing the float, which had gotten wrapped around a rock and was bobbing around at the edge of the ramp :) While we were setting up gear, we decided to test out our DiveAlert air horn thingies which we haven't tested in ... a long time. I found that mine completely doesn't work. It just hisses like a leaky regulator. I guess all that time I've been carrying it around in my pocket it was really just removable ballast. After sorting that out and staging our scooters, we headed into the water. We timed it so that the entry was really easy. The ramp was super clean of algae, which was nice. The plan was to head out along Cannery Point and over to the area south of (shallower than) Shortcut Reef, just to see what's over there. If the conditions made the shallower areas undesirable, we'd go to the Three Sisters are as a backup. When we got in, we found that the vis was unimpressive in the cove. We scootered out to the edge of the cove, and dropped in about 20 feet. There was a ton of particulate in the water, and it was surgy. After we got a little further out in the sand channel, I continued my X-acrobatics training, and did a loop-dee-loop, which is a new trick for me. I just don't look as cool doing these tricks as the boys do. When we got to Hole in the Wall, the viz was still quite craptastic, and it was still surgy. It was actually a little tricky to make out landmarks because of the viz. After we got a little bit past there, Kevin asked if we wanted to keep going the way we had planned, or if we should head further north (and deeper). We decided to go deeper to see if the surge improved. We headed to Beto's Reef, and looked around there for a few minutes. The wolf eels were not there (which is the third time in a row that we have not seen them :( ). 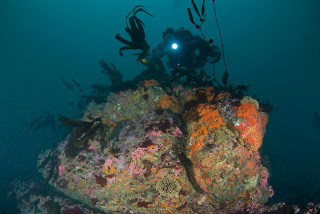 I did see a lingcod there -- that place seems to be crawling with lings lately. Then we headed west, and passed by the sisters, where we paused and decided to continue on to Shortcut Reef. When we go there, it was still super surgy even at 90 feet or so. Rob whipped it out (his camera, that is) and started taking some pictures. I think Shortcut Reef would be really fun to scooter around in better viz. But in the viz we had, you couldn't really appreciate the structure. Macro-wise, I didn't see anything particularly interesting. 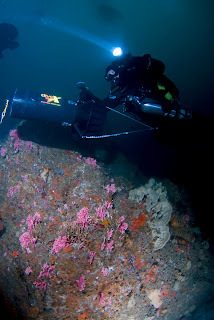 There was a lot of the pink skinnier hydrocoral. Rob set me up for a picture, and after he finished that up, he started gesticulating at me. He gave me the bag shoot signal and then pointed at his camera. I was thinking he wanted me to shoot a bag and ascend because his camera was flooding. But he seemed a little too calm for that, so I asked him again... the neoprene cover for his dome port had floated off. He keeps it bolt snapped to the camera, but I guess it slipped off (the bolt snap stayed).